Yesterday it was cloudy and cool and it almost rained. I mean the patio was the tiniest bit damp and the air smelled like rain.. but that was it. But it felt like a day to get totally cozy, snuggle in, watch CSI and drink coffee. SO I DID THAT. For a while anyway, thanks to Esquire TV and it's little marathon of CSI episodes! But then I had to get up and actually do something, so I returned to my little project, the sewing rooms. Actually I'm just working on the 'cutting room' which is Frankie's old room. It's still a room for her to visit, but I've added in a 4 foot folding table that I now cut at, freeing up the dining room table for its intended purpose. (you know, to pile stuff on like mail and random things you're not sure what to do with) Anyway Frankie had a shelf over her desk, so my table is under the shelf and I'm trying to keep it cute and functional. FINALLY I unsealed that package of scalloped trim that I bought YEARS ago, and put it on the newly painted shelf. It felt magical. I spent a lot of time organizing just those few things. Everything needs to be auditioned. I have little treasures hidden here and there that I will dig out. Like that 40th Anniversary Hello Kitty bobble head. I actually pulled it out of its protective packaging!!!! I know, I felt a little faint when I did it. But I quickly put the packaging in the recycling so I wasn't tempted to put it back in there. FOR IT'S OWN PROTECTION. I love looking at all the wonderful pictures of people's sewing spaces and just homes in general. I admire people who really keep it all together. For now I'll just keep walking by and surprising myself. Baby steps people. I love these fun every day style posts like the posts from years ago. They aren't trying to sell me something and aren't like a magazine spread every time. Real life stuff. Something relatable. Thanks for sharing. However, that's not saying that I wouldn't enjoy some new fabric! thankyouverymuch. 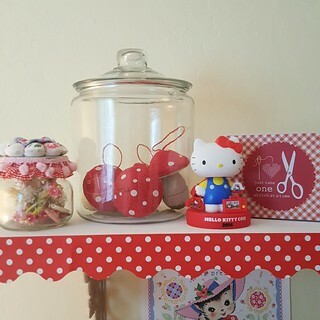 Lovely little shelf...such pretty things on it and the red scallop edging is adorable!